As promised, here is the 2nd page of mine and J.B. Martins' comic "Empregado Precisa-se" (could be loosely translated into "Help Wanted"). In this page, our young job seeker faces what no one ever wants to face when looking for a job: a mad hunchback lab-assistent with a blood stained apron. What will happen next? Stay tuned to find out! 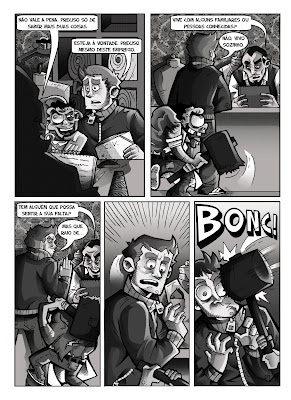 This comic was published in the comic anthology Zona Negra 2, and you can order it here.